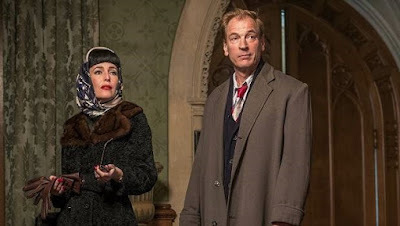 As Christie fans vigorously debate the merits of Sarah Phelps' scripted 2018 adaptations of the Queen of Crime's novels The ABC Murders (1936) and Ordeal by Innocence (1958), I'd like to remind people who may have missed it that there was another Christie film--one much more calculated, it seems to me, to please traditionalists/textualists--which appeared recently, in 2017: Crooked House, an adaptation of the 1949 novel that was co-scripted by Julian Fellowes of Gosford Park and Downtown Abbey fame. Most people who read this blog probably know the plot of Crooked House, which Christie once named as one of her favorites among her mysteries, along with another non-series novel, Ordeal by Innocence. 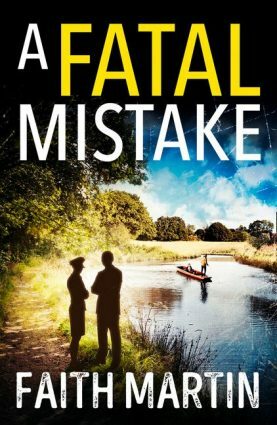 (Both of these novels have no appearance by Christie's sleuth Hercule Poirot, and this was a time when the author was rather down on Poirot.) It certainly plays to Julian Fellowes' interests, being set at a huge country house among a wealthy family of eccentrics who are partly descended from country gentry. 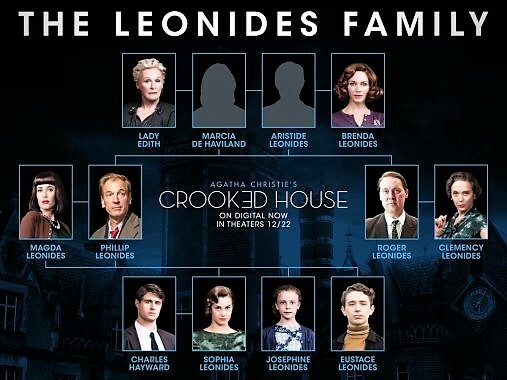 In marked contrast with recent Phelps-scripted films, Crooked House stays mostly faithful to the book. Wealthy 86-year-old Anglo-Greek business magnate Aristide Leonides (inspired by Aristotle Onassis?) dies from an insulin injection fatally laced with eserine (used in eye drops). His lovely and level-headed granddaughter Sophia Leonides hires PI Charles Hayward, son of a late Assistant Commissioner at Scotland Yard, to investigate Aristides' death. Sophia and Charles recently had a romantic relationship in Cairo, when Charles served with the Foreign Office, but it was soon broken off. (We see much of this in flashbacks.) However, the decidedly handsome pair still seem to carry torches for each other. Laurence Brown, tutor to Eustace, and Janet Rowe, Josephine's nanny. Also let's not forget Chief Inspector Taverner from Scotland Yard. Charles interviews the various eccentric family members and finds among them suspects galore, without seemingly making much progress in actually pinning the crime on one particular person. Much of the family itself prefers to believe that Aristide's killer was Brenda, who administered the insulin to her elderly husband on the fatal night. Brenda, it seems, may have been having it off with Eustace's handsome young tutor, Laurence Brown--who is, by the by, something of a Red, and therefore naturally suspicious. But other members of this weird family had motives too, which mostly center on daddy's money. 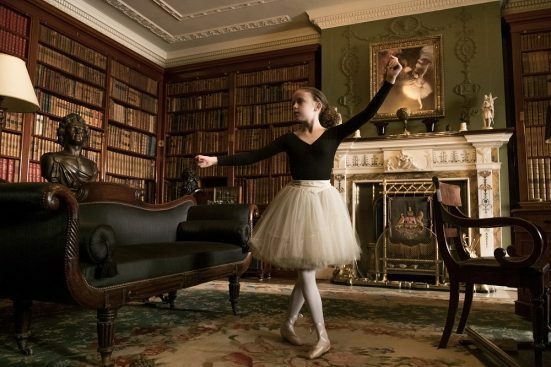 Aristide's snoopy granddaughter Josephine, who fancies herself a detection expert and eavesdrops on everyone in the house, making notes in a book, might help Charles, but she remains irksomely cryptic, preferring that he play Watson to her Holmes. Does she really know something, like a precursor of Alan Bradley's Flavia de Luce, or is she simply a childish poseur? 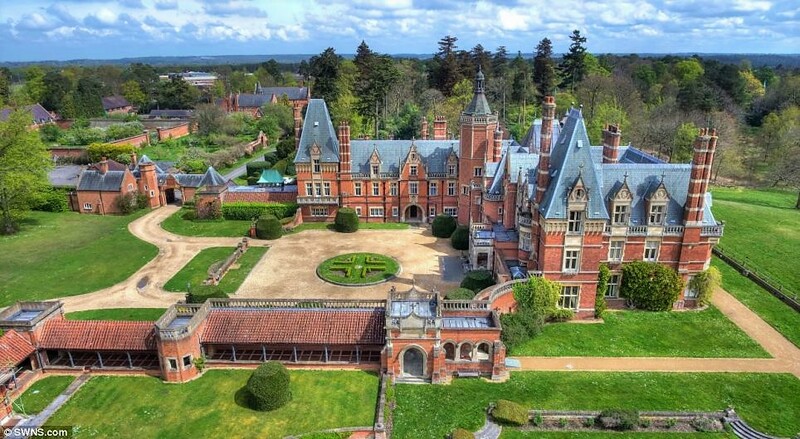 Aristide was physically crooked but also very much a ruthless businessman so possibly was "crooked" in that sense too. 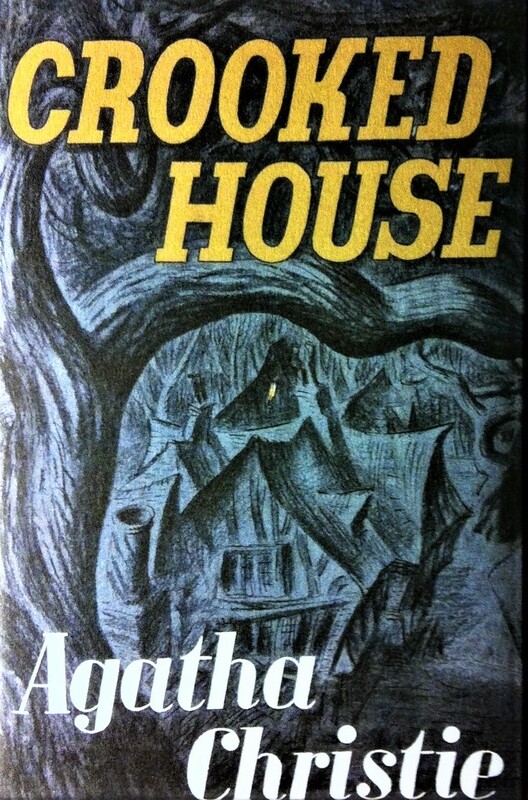 And he did indeed live in a crooked house, though it is far from little, being a monstrous fungoid growth of a English country cottage as only an emigre could imagine. The filmmakers used Minley Manor, a massive asymmetrical French Gothic mansion built by a Victorian banker in 1860, as their "Crooked House"; and while it's not exactly what Christie describes in the novel, it certainly makes an impressive setting, both in the exterior house and grounds and its often atmospherically ill-lit interiors. It's a good thing too, since most of the film takes place at the house. But even odder than the house are most of its its inhabitants. Stealing the show here are Gillian Anderson, who plays Magda Leonides, the narcissistic stage actress, along with the wonderful Glenn Close, who plays Lady Edith (though Close comes off, despite her bluff tweedy ways, as comparatively normal compared to the rest of the family) and 12-year-old Honor Kneafsey as nosy little Josephine, in a role that could have been written for Saoirse Ronan around the time she did the film Atonement. Among the men, though it was nice to see Julian Sands (still looking good y'all!) as Magda's husband, I thought the honors were won by 18-year-old Preston Nyman as the snide polio-stricken Eustace. He puts some bite into that role. I also liked Stefanie Martini as Sophia, though I thought Max Irons (son of Jeremy) was unfortunately rather on the bland side as Charles, a part which I believe was originally meant to go to Matthew Goode (who ended up in Ordeal by Innocence.) Goode would have been better! (Gooder?) Oh, and the great veteran Terence Stamp as Chief Inspector Taverner was a wonderful bit of casting, though he was a bit past retirement age, I suspect. But he was terrific nevertheless, and could have passed for ten years younger. 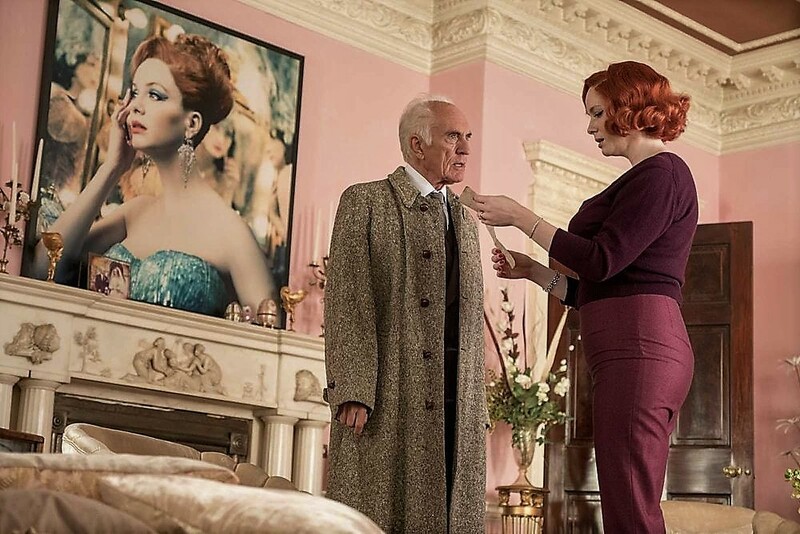 The film relies heavily on interviews at the house (though there's a wonderfully bitchy dining table scene that would have done Gosford Park proud), and that may be a boor to some, but I think the colorful (if not campy) character portrayals help carry things off with panache. The climax of the film adds excitement and even real emotional resonance, though perhaps it is somewhat incongruent with the often archly amusing tone of the film earlier. Crooked House offers a classic and quite artificial murder set-up: the strange family improbably all cooped up in this grand yet stultifying living arrangement, seemingly just waiting to get bumped off. It's reminiscent of such splendid genre chestnuts as Ellery Queen's The Player on the Other Side (1963) and S. S. Van Dine's The Greene Murder Case (1928). So the shift in tone may be more due to Christie herself than the filmmakers. It's hard to make realistic, in-depth characters out of all of these chess pieces, delightfully quirky as they may be. Still for a lot of us the mystery is the thing, and the book's solution, one of Christie's cleverest, is happily preserved in the film and well staged indeed. 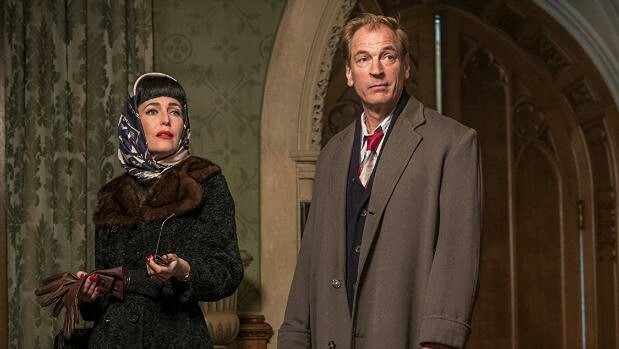 Crooked House seems a nostalgic throwback to the "old days" of the Seventies film versions of Murder on the Orient Express and Death on the Nile, with stars taking delicious turns in sumptuous, yet oh-so murderous, surroundings. Devoted fans of the Queen of Crime needn't worry here about Christie getting all Phelpsed up by the filmmakers. Who is in her sights? 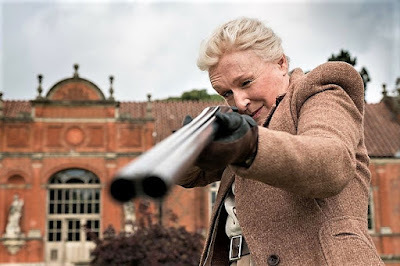 Lady Edith (Glenn Close) takes aim. I like your new verb but suggest “Phelpsed down” is a better fit.